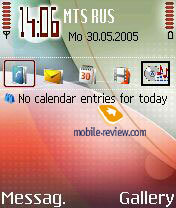 The 60th platform (Seires 60, built above the Symbian core) has become the main line of development for Nokia. And within this platform the company demonstrates the main technological innovations (qualitative cameras, wireless Wi-Fi modules, integrated hard drive and high resolution screens). We'll remind the company doesn't position the Series 60 devices as smartphones, it promotes them exactly as functional phones on purpose. No marketing materials mention it's a smartphone and no ad stresses it. The Series 60 platform is getting the main one for the company replacing the Series 40. The last one now acts in the low-end, middle (up to 200 USD) and fashion segments. Now the company artificially distinguishes the Series 40 and Series 60 with the phones' dimensions, the current smartphones are significantly larger than usual Series 40 phones. 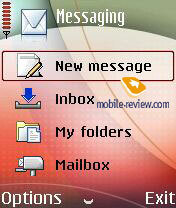 In 2006 with the appearance of thin and small smartphones it will be possible to speak about this border deletion. Let's have a look at the present smartphone line by Nokia. We'll take the current wholesale prices and a relative margin of 10 percents. Thus define approximate retail prices. We are interested in the price exponent and a slight mistake is possible (real retail prices in Moscow are a bit different). The company's goal while forming a model line is to cover the whole price diapason with the models and widen it if possible. Not considering the N-Gage QD, 300 USD level may be taken as the bottom border of the diapason and it will fall to 220-230 USD within the year. The Nokia N90 and Nokia N91 (up to 750 USD) will act in the top segment. The second goal following the first one is described below. While segmenting and placing the devices on the price line it is important for the company to explain to the consumer how the price forms. Why one smartphone costs 300 USD and another one is 550 USD, why a new device should be bought and the old one worth forgetting. The company shows the progress, new functions and new design in new models. But this progress is not as significant and revolutionary. Since having announced something principally new in this month the company will find it hard to surprise the customers the next month. Thus the strategy is to demonstrate gradual visual improvements in new models and no maximum functionality devices. Old models shift to the low price segments with time. As we see, the improvements are not revolutionary but still allow setting a higher price for the device. The current model line won't be enough for filling the whole price diapason evenly. And we will see many new announcements by Nokia in the nearest future. 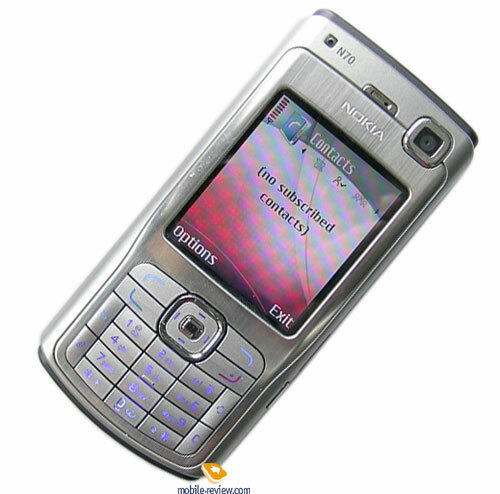 The Nokia N70 is a more developed versions of the Nokia 6630, the models are built on the same hardware platform. That's interesting the presence of an integrated Bluetooth 2.0 module was announced in the specs that turned out only a mistake in practice. 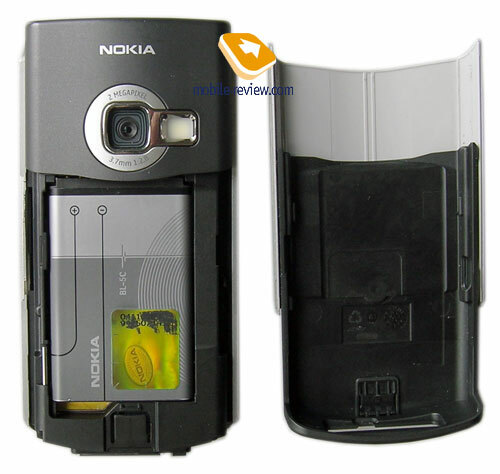 The body contour is even stricter than in the Nokia 6680, the rounding are even sharper. The top and the bottom edges are splay. 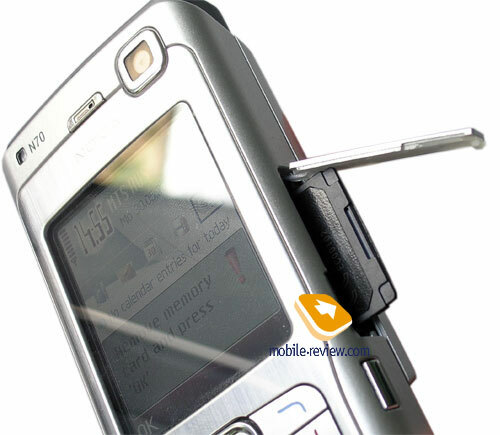 We'd like to stress the design is well-taken and many people like it, the device won't be confused with the Nokia 6680. The body is of a silvery and smooth plastic. The screen are the keypad are surrounded by an insertion making a metal illusion by tactile feelings and behavior in the sun. It matches the whole design well. As smartphones take more space in the company model line their design will become more consistent. 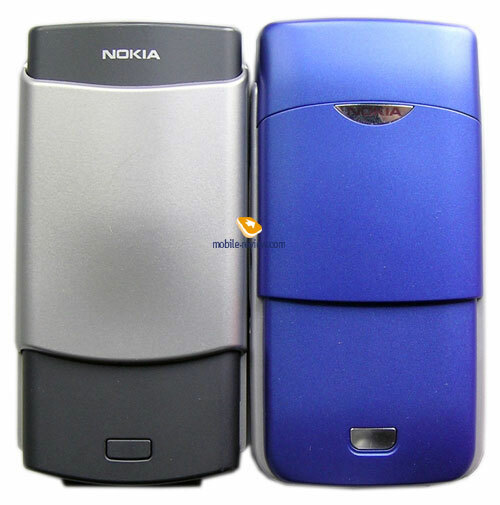 The Nokia 3230, Nokia 6680, Nokia N70 are good examples. 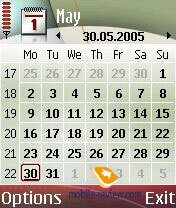 The keypad was really changed as compared with the Nokia 6680. It got smaller and number keys became small also. The keys are not transparent now and are backlit with blue. Soft keys now take four times less room and call cancel and accept are now placed horizontally and not vertically. The "Menu" and "C" button got lower and an editing button ("Pencil") is now placed on the left side but not the right as earlier. A new personally programmable "Multimedia Key" was added. We'll talk about the joystick in details. While the 5D navi button of the Nokia 6630/6680/6681 was one of the most comfortable, the Nokia N70's tough joystick can't be praised this way. It sometimes works incorrect and pressing its center is uncomfortable, one of the directions is pressed instead. In general we see an evident worsening of the keypad ergonomics, probably for the sake of the design. The dimensions are typical of Nokia (108.8x53x21.8 mm), the weight forms 126 g. Visually, it is a bit smaller than the Nokia 6680. The device may be carried in any pocket causing no trouble. You'll only feel the weight if carrying the phone in a shirt pocket. Generally, the phone is for a man's hand though not scarring away a woman, the design attracts. In the dimensions and the weight the smartphone looses to the HTC ones, for instance the HTC Typhoon (107.54x46.2x17.5 mm 106.3 g). It's not really seen in the numbers but put the devices near each other and the difference will get obvious. To tell the truth, this comparison is incorrect, since we should consider WCDMA support. A voice control button disappeared from the left side. A power button and a loudspeaker are on the top. An RS MMC connector closed with a shutter fixed with an elastic band (it's not clear why a metallic shutter was refused) is on the right side, hot change is naturally supported (at the shutter opening all the applications are closed). ). Just similar to the Nokia 6630 the device supports only dual voltage reduced size Multi Media Card, since an integrated reader supports only 1.8 W. With time we'll pass to a commercial name of this card and say MMCmobile instead of DV RS MMC (read the details in this document). A camera button on the right end should be mentioned also, it is used for portrait mode shooting. 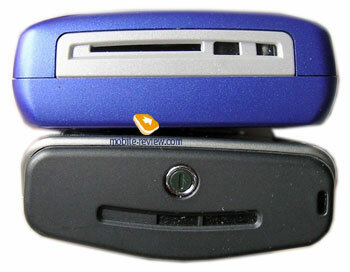 A standard for Nokia products POP-port is on the bottom end. And a charger connector is new (much smaller in size) alike the whole N-series by Nokia. Now this solution shows no necessity but with the appearance of thin devices it will get useful. A stereo headset is included into the package. Sound quality is not bad even with standard earphones. The disadvantages are - low volume (even the max level), the music is not heard in the tube, personal earphones are impossible to plug in, the output is not standard. An extra loudspeaker is on the top end, it's may be used for listening to the music, the sound is pleasant and doesn't wheeze at the maximum level, no evident frequency failures. The screen resolution and size are standard - 176x208 pixels, 2.13" in diagonal (41x35 mm - active space). 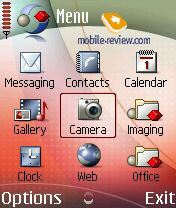 The screen is completely alike the one of the Nokia 6680/6681 with announced 262K support. 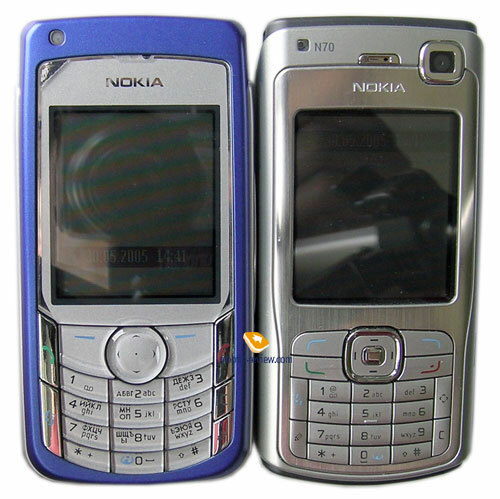 However you won't see any difference from the Nokia 3230 in practice, though it shows only 65K similar to the Nokia 6630. Color rendering remains fashion and only. The display is one of the best among smartphones without a touchscreen. Comparing it with the screens of usual phones is incorrect and we won't do that. The thing to mention is the 176x208 resolution is getting outdated and a high resolution screen will be represented in the Nokia N90 and further products. 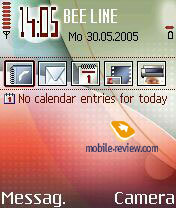 The candybar devices with new resolution are planned for the beginning of 2006. Backlighting brightness may be set manually, thirty levels. The tuning is not smooth and not more than 15 levels are actually provided, though it's not bad. Besides the system adjusts the backlighting automatically depending on the light sensor under the screen (starting with the basic level set manually). 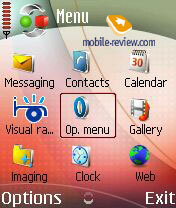 Date, time, profile name, missed calls and unread messages are indicated on the screen in the standby mode. The removable Li-Ion battery BL-5C is capacious of 900 mAh. If disassembling the phone one will see a bidder battery could have been placed into the body, there is free room between the battery and the back cover. Claimed battery life forms up to 11 days in the standby mode and up to 3.5 hours in the talk mode. The device worked for 1.5 days under the condition of Moscow network in case of 30 minutes of talks, 25 photos with the flash off, an hour of working with other functions and Bluetooth on. Turning Bluetooth off and minimal working with the phone (15 minutes of talks at all, 20 minutes of games) increase battery life to 2.5 days. Up to 1.5 days are possible if only listening to the radio about 3-4 hours a day. In general much talking users will have to recharge the device everyday. Using it moderately will allow 2 days battery life. Full recharging takes about 1 hour 15 minutes. The battery is relatively weak; the very HTC Typhoon (I-mate SP3, T-Mobile SDA and others) works about 3-4 days under similar use conditions. We thought the Nokia N70 had to work not shorter than the Nokia 6680, but that's not true yet. 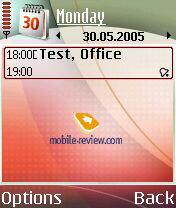 That is a reason to return to the Nokia N70 when a commercial prototype appears and then test battery life. Quite an unusual and comfortable SIM-card holder is placed under the battery. 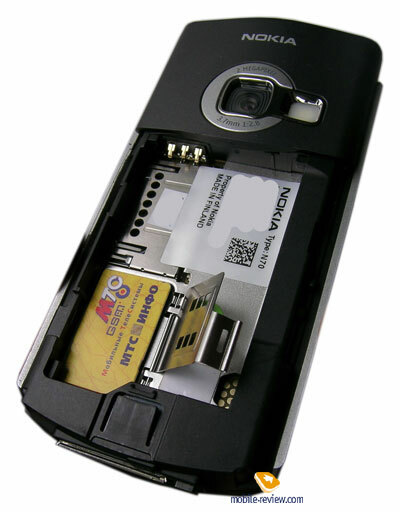 Like all the N-series devices the Nokia N70 is built on the Series 60 version 2, the third service pack is used (Series 60 2nd Edition Feature Pack 2, or Series 60 version 2.6). . The support for QWERTY keypads is worth mentioning. 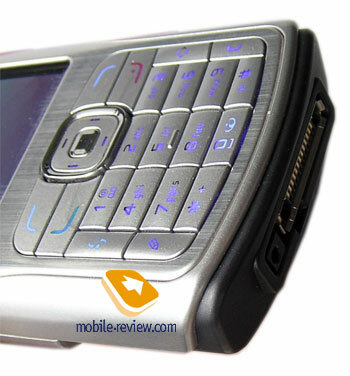 The Nokia N70 has neither new screen resolution nor integrated QWERTY keypad. 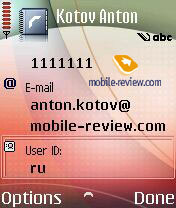 The Symbian core version is 8.1а. And what is the main change then? 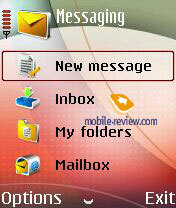 All the design elements are finally redrawn, colour solutions of preinstalled applications have changed a bit. 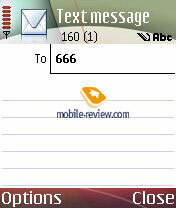 Look at the comparison screenshots (to the left - the Nokia N70, to the right - the Nokia 6680). 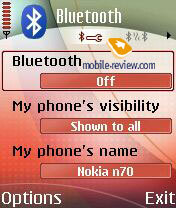 There is a set of extra settings inherited from the Nokia 6680/6681 besides the changes that the Feature Pack 3 includes. That is an active slider, opening it will activate the camera and the main thing is Active Standby. That is a copy of a Today start screen for Windows smartphones. Everything is quite logical - five icons for quick start of the applications. You can use the joystick to move along the list that may be changed by your wish, set the start screen for yourself. A to-do list is lower. If the player is on the bottom line shows the name of the composition currently playing. And the last thing to point out is compatibility with third party programs for younger smartphones. 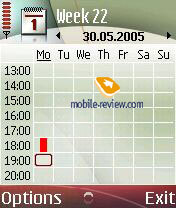 Today the N70 completely resembles the N90 in this term since old third party programs almost do not work. I suggest returning to the question later when commercial examples appear. I don't want to believe compatibility will remain such a poor thing. Bluetooth is traditionally the maximum functional, all the profiles are supported, including HID (wireless headset may be connected with no special drivers). 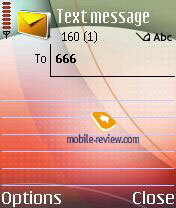 That is an advantage of this smartphone over the above mentioned HTC Typhoon. I'd repeat the specified Bluetooth 2.0 version was a mistake and now the review on the company site is corrected. One of the peculiarities of the new N70 is the presence of an integrated FM-radio. Reception quality is good but strongly depends on the wire position since it serves as an antenna. Radio supports stereo sound though in Moscow it rarely worked and the main broadcast was mono. There is a good automatic search for stations. 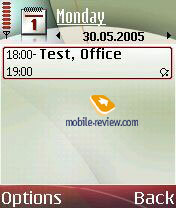 The 3D package of the SPMark04 test failed working on the device, like the Nokia N90. We had only to measure productivity with the JBenchmark 2 and 3D. 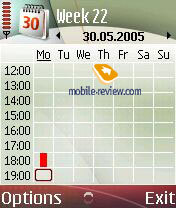 The Nokia N70 is at a high level considering the reception that is typical of the Nokia smartphones. The signal is loud and hard to miss in a noisy street; one of the following file formats can be used for a call signal: MIDI (64-tones polyphony), AMR (NB-AMR), True Tones (WB-AMR), WAV, MP3, AAC, eAAC+. The vibracall is average in power. 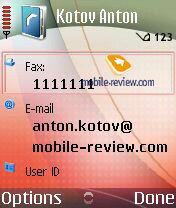 There is no sense in changing the Nokia 6630/6680 for a new smartphone. The changes are not as principal. Added 2 MP camera, FM-radio but the ergonomics got worse. 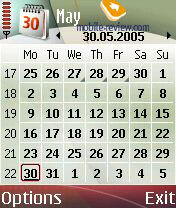 The Nokia N70 will be launched in the 3Q 2005, the start price will form 650 USD and then will fall to 450 USD.